We will pick you up from your cruise ship docking in Ein El Sokhna port then travel with your personal Egyptologist guide and private modern van to explore Giza Plateau. It is home of world’s greatest attractions, visit the Great Pyramids of Cheops, Chephren and Mykerinos then drive to the mysterious Sphinx & the valley temple related to Chefren pyramid complex. Get your lunch in local restaurant in the way to the world known Museum of Egyptian Antiquities that was established in neoclassical design and features great collection of 120000 masterpieces cover 50 centuries of Egypt art from all known historic ages including the treasures of King Tutankhamen. End the trip then transfer back to your cruise in Ein El Sokhna port. Book Ain El Sokhna Wheelchair Tour to Cairo. 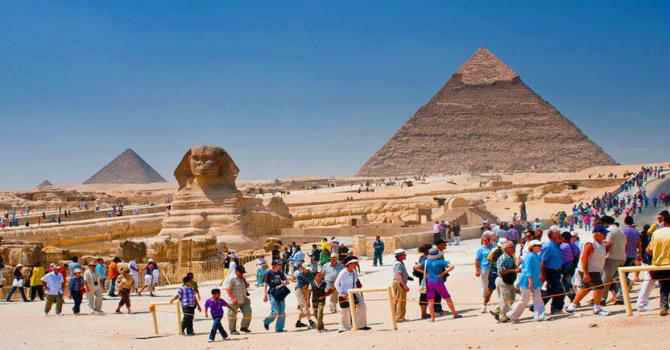 Disabled Trip to Giza pyramids, Sphinx, Egyptian Museum & Cairo Accessible Excursion From Ein Al Sokhna Port.